In February I visited Amboseli, Lewa Wildlife Conservancy and the Masai Mara in Kenya with my friends, Lucy Parratt from WWF and Anne and Mike, fellow WWF supporters. We visited the Masai Mara Predator Project, which is supported by WWF where we learned about some of the incredible work in which they are involved. 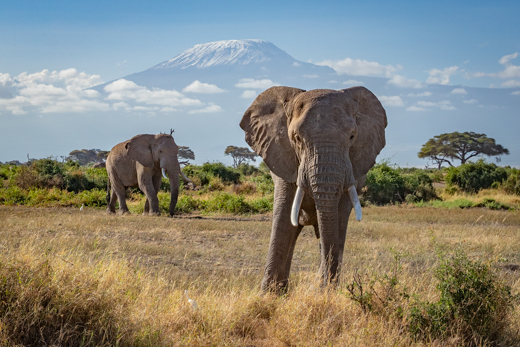 At Amboseli we saw large herds of elephants, some as many as 100 strong. We also had some great sightings of the snow-capped Mount Kilimanjaro. In the Masai Mara we saw lots of lions, with one pride made up of five females with ten cubs. We also had some good leopard sightings. At Lewa Wildlife Conservancy we saw large numbers of both black & white rhino and the critically endangered Grevys Zebra. Lewa is one of the best places in the world to see rhinos and is now a UNESCO World Heritage site. At one watering hole we encountered five rhinos, alongside elephants and zebras, which is an incredibly rare sighting. Click on the image below to view images from the trip. Fixation UK Professional Photographic Services, Canon / Nikon sales & repairs. Genesis Imaging Supplier of high quality digital photographic printing, mounting & framing. Hoopers Afica trust Hoopers Africa Trust (HAT) is a charity founded to transform the lives of disadvantaged girls in Kenya. Paradise Wildlife Park Paradise Wildlife Park is a leading animal attraction in Europe. Wildlife Heritage Foundation W H F is committed to the conservation of plants and animals throughout the world. WWF-UK Safeguarding the natural world.